On January 30, 2017, Mansfield Plumbing employee Ron Kline marked 52 years of service with the company — 18,980 days — with a perfect attendance record. At the age of 72, Kline has no anticipation of retiring. He enjoys his work, is blessed with good health and wants to keep on trucking — literally. As a truck driver for the sanitaryware and bathware company, Kline can travel between 350 to 500 miles a day making customer deliveries of toilets, sinks and tubs. Hired on January 30, 1965 at the age of 20 as a clean-up person at the Mansfield manufacturing facility in Perrysville, Ohio, Kline relishes his work and his family. 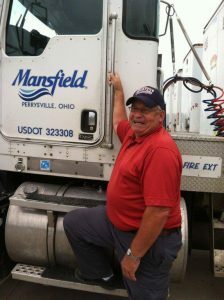 The father of 11, grandfather of 38 and great-grandfather of eight, Kline is keeping a family tradition going strong at Mansfield Plumbing. Married for 52 years to his wife Lois, Kline has been actively involved in his community his entire life. He coached basketball and softball at the high school level for decades and is a member of the Mohican Area Community Fund. Kline spent his first 18 years with Mansfield as an inspector/grader of sanitaryware products as they came out of the kiln. “I checked for cracks and blemishes to make sure the quality was there for each and every piece that went out the door,” says Kline. “About 34 years ago I decided to try driving a truck. That’s been a terrific job because I’ve been able to make deliveries to every state east of the Mississippi River.